One of the things I want to do while here is visit all of the 'best Kauai beaches" according to the travel guide we are following. Except for one beach we have visited since living here, all others have been beautiful and enjoyable in various ways. 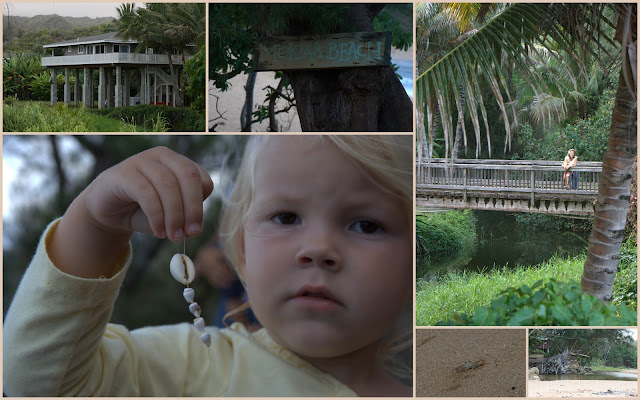 Last week we visited Moloa'a beach. The day we went there a swell was making the water rough to enjoy but the scenery was still amazing. We followed a trailed along the shoreline for about 1.5 miles looking for turtles. Unfortunately the water was rough and it was crashing really hard against the rocky coast. It made for loud splashes and beautiful contrast between the white foam and the black lava rock, but it also made it hard to see anything in the water. On our walk Emilia found some shells someone threaded together. There aren't very many shellfish in Kauai because of the clean and warm water so these were a rare thing to see for us. I've noticed for a while little holes in the sand. I didn't know what they were until recently when I saw a small crab crawl into one. They are tiny, fast and the same color of the sand so it's really hard to get a decent picture of one. Sometimes they are so fast that it seems as if they are just being blown by the wind to their next hole. According to Wikipedia "These crabs are called ghosts because they are translucent, and because of their ability to disappear from sight almost instantly, scuttling at speeds up to 10 miles per hour, while making sharp directional changes." They are mainly seen at dusk when "they sprint to the ocean to obtain oxygen from the water." Many of the homes near the beach are raised up from the ground to prevent flooding in case of a tsunami. It seems as if the newer the construction, the higher they are built. The house on the photo was thee floors high. I wouldn't want to carry my groceries all of the way up those stairs! I wonder if they not only want to save their house from flooding but they also want to get an unencumbered view of the beach all the way from where they are?